Special thank you to Andrew. He is an original founding member who deeply believes in this work since he was six years old. Presently a high school honor student studying aboard. So proud of him! Pictured here holding Nat Hentoff’s book, “At the Jazz Band Ball Sixty Years On the Scene”….the last chapter of this great book focuses on the Kids for Coltrane! Jordanne Gibson (far left), Brilliant 2013 Kids for Coltrane Reach for The Stars Award winner with her outstanding Kids for Coltrane friends. Check out Nat Hentoff’s latest book, At the Jazz Band Ball: Sixty Years on the Jazz Scene. It is terrific! I am very happy to report that Mr. Hentoff dedicated the last chapter of this book to my work with the children. He told me that the work gives him hope for the future. I am most grateful to the brilliant writer, Nat Hentoff. His body of work has inspired me and gives me hope for the future as well! Summer 2009 attending THE FUTURE OF LEARNING INSTITUTE at Harvard University. Here I am taking in the sites during an early evening walk through exhilarating Cambridge. This picture is in Harvard Yard with a statue of John Harvard. While attending the Future of Learning Institute at Harvard University this summer 2009, I had the good fortune of being in an interactive course led by the brilliant Dr. Mary Helen Immordino-Yang. This is a picture of Mary Helen teaching us about her work studying brain bases of emotion, social interaction, and culture and their implications for development and schools. Mary Helen is a cognitive neuroscientist and educational psychologist. Her lecture was outstanding! We all left inspired and determined to learn more about her work ….by the way Dr. Immordino-Yang is a former junior high school teacher. She lectures nationally and internationally on the implications of brain and cognitve science research for curriculum and pedagogy. Mind/Brain Research and the Future of Learning Plenary, Harvard University Summer 2009. Here is a photo of Veronica Boix Mansilla thanking presenters Howard Gardner, Kurt Fisher and David Rose for their exquisite presentation. The focus this day was a discussion about new developments in biology and medical sciences that are affecting the nature of learning across the human life span. The esteemed presenters distinguished between the popular and more responsible literature on mind brain and education. Topics that were addressed included brain-based understanding of the relationhship between cognition and emotion, life-long learning; and computer aided personalized education. It was extremely illuminating and very enjoyable. Ellen Winner led a mind/brain interactive course distinguishing between research and advocacy. Examining claims about the effects of brain stimulation and arts education the course was thought provoking and inspiring. Professor Winner was warm and accessible. The class was very interactive. Ellen is also the wife of Howard Gardner. What a great team! All participants in Harvard’s Future of Learning Institute were assigned learning groups. We used thinking routines to make our thinking visible. During our discussions we examined “burning questions” and explored throughlines. My amazing group was led by two excellent facilitators. In this environment we were able to synthesize and personalize the information introduced in the plenary sessions and interactive courses. We certainly deepened our understanding of globalization, the digital revolution, and current mind/brain research. I was blessed to be in a group led by Project Zero’s Tina Blythe. She is currently the Director of Faculty Development at the Boston Architectural Center and an adjunct lecturer at the Harvard Graduate School of Education. The group was co-led by Karin Morrison from Australia who is the Director of the Rosenkranz Centre for Excellence and Achievement at Bialik College. I cannot say enough about these gifted and talented women. I want to thank my classmates for having open minds and open hearts. These incredible folks were from across the globe, and proved it is a small world after all. This is a pic of Karin and Tina during one of our learning group sessions. A room with a view…a wonderful view of Harvard Square. While in Cambridge I stayed at The Charles Hotel, great place with a kind and welcoming staff. There is even a jazz club on the premises…How perfect is that! Harvard’s Dr. David Perkins….in a word “brilliant”. I had the opportunity to participate in two institutes in which David was one of the lead presenters and organizers along with my hero in education Dr. Howard Gardner. The research going on at Project Zero is outstanding and fills me with hope. Picture on my birthday with gifted musician Louis Vignapiano. Lou and his lovely wife Nicole attended my surprise birthday party. Lou thrilled the guests with his brilliance on the guitar. My students and I enjoy songwriting during the year using Lou’s beautiful compositions for inspiration. Meeting my childhood friends for dinner in Bayridge, Brooklyn with my daughter. We had a wonderful time reminiscing. Teaching artist Jeff Hopkins with New York City Council Member James Gennaro. It was a pleasure teaming up with Jeff during a year long art project at The Holliswood School focusing on the work of William Steig. The middle school students who participated were outstanding and loved working with Mr. Jeff. This project was made possible through the Jewish Museum and Mr. Gennaro. This pic is at our reception which showcased the children’s work. I remember conversing with Council Member Gennaro about John Coltrane’s sheets of sound during the reception. Who knew he was such a jazz fan…good for you Mr. Gennaro. March, 2009, The Celebration of Teaching and Learning Conference in New York City. I had the opportunity to hear Dr. Daniel J. Levitin speak about music and how it affects the brain. It was a most illuminating seminar. Check out his books This Is Your Brain on Music and The World in Six Songs. During the fall of 2008 I accepted a wonderful invitation to partipate in seminars on the life and music of the legend John Coltrane. They were presented by the engaging and very intelligent Phil Schaap at Jazz at Lincoln Center. Check out their website for other seminars that may interest you. I had the pleasure of leading a workshop on the life and times of Benny Goodman at Jazz at Lincoln Center. Collaborating with me were Jazz at Lincoln Center’s Sherman Irby and Samantha Samuels. It was an inspiring and uplifting experience. Senator Frank Padavan honored us by visiting the Holliswood School in the spring of 2008. He attended a special assembly program presented by The Kids for Coltrane. Senator Padavan was most impressed with the children. May 2008, musician Louis Vignapiano performing for the children during my special Kids for Coltrane Assembly. The children performing a dance we choreographed in honor of John Coltrane. We called it Chasin’ the Trane. Pic of me in my classroom with an incredible group of children. This was a looped class. 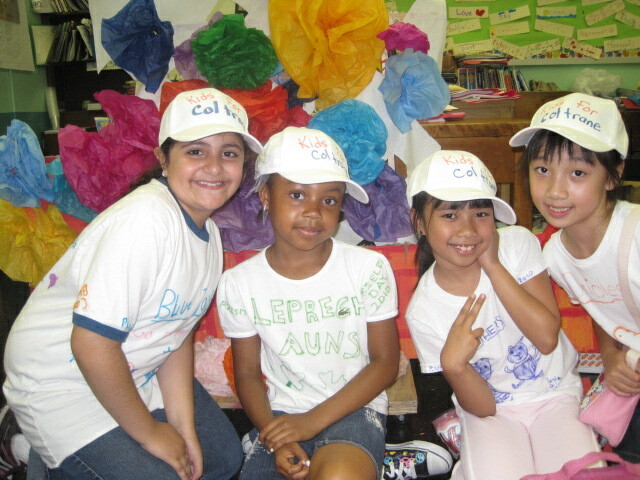 I had the pleasure of being their teacher in first and second grade during 2006 -2008. Together we created an enriching learning environment. The second year of this program I was honored to work with school para Santa Lee. She is a dedicated professional. When the two years ended the parents asked me to teach their children for a third year. That was not possible, but after receiving a persuasive letter from my student Andrew I came up with an idea. He asked me to find a way to keep the group together. That is when I created The Kids for Coltrane Club. I volunteered to work with the kids after school almost every Friday during 2008 -2009. Now third graders the children continued to dance, write lyrics, and sing. We even wrote lyrics to Coltrane’s Equinox…see the Songwriting page on this site for more on this. We called it…HAMLET’s CHILD. The children working on a philanthropic effort to raise money for the non profit Friends of the Coltrane Home. They raised 1500 dollars to help the effort that is underway to transform John Coltrane’s Long Island Home into a learning museum. Please see their site in my links section. You too can help make this dream a reality. This is a pic of the children with prizes they gave away at The Holliswood School. They are holding autographed CD’s donated by musican Ravi Coltrane. 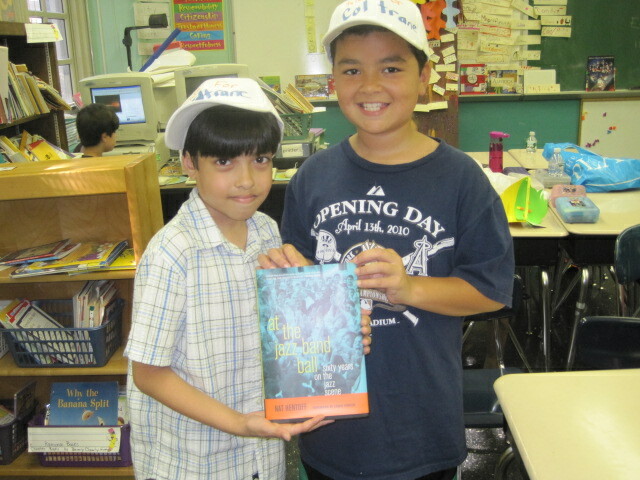 The children proudly holding prizes donated by Jazz at Lincoln Center for their philanthropic effort. Joanna Massey from JALC brought the prizes over personally to the children and encouraged this wonderful learning project. 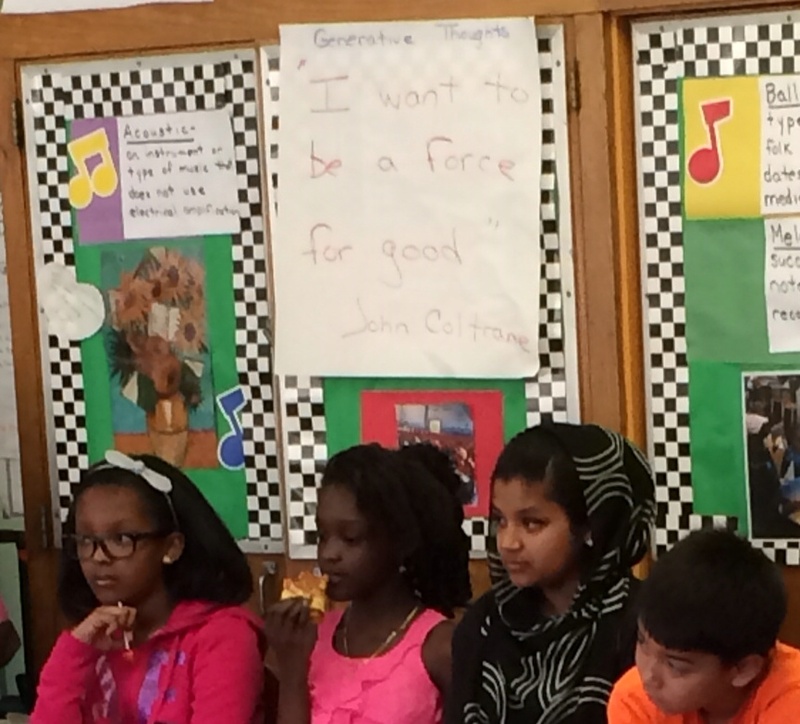 The students wrote a powerful persuasive letter to President Bill Clinton asking if he would like to help them in the effort to transform John Coltrane’s Long Island home into a learning museum. We were all thrilled when he sent an autographed copy of his book Giving which was awarded to a Holliswood School student. Here is a pic of one of The Kids for Coltrane, Stephen, holding his book and a letter encouraging the children in this effort. And the winner is Maya…here she is holding her prize. President Clinton sent Maya a personally autographed copy of his book Giving. When the project was over he sent over a fabulous letter, dated February 4th 2009, thanking The Kids for Coltrane for their letters and posters. He said he was pleased to be part of this philanthropic effort. “I hope you all will continue to enjoy your studies, volunteer to help people in need, set high goals for yourself, and work hard to reach them. You can do great things,” he wrote. We are grateful to him for his contribution, kindness, and encouragement. We know he will continue to do great things too…and we also know that he is keeping music in his heart when he plays his saxophone. William was so happy to discover he won an Eastwood Joey Leone Signature guitar. The charming and caring Yoko Ono…I had the pleasure of hearing Yoko speak at an arts conference in New York City in 2008. The conference was presented by the UFT. Check out her IMAGINE PEACE TOWER in honor of her husband, the legend John Lennon. With my cousin John Turturro backstage in New York City, after his performance of Hamm in Endgame at the Brooklyn Academy of Music. He is still in costume in this pic, and as charming as ever. He greeted the family with open arms as usual. John is a terrific actor and magnificent human being. Ravi Coltrane and Dave Liebman performing for supporters of Friends of the Coltrane Home in Huntington, Long Island. I was invited to this special performance and had very a memorable day. My children two of the most beautiful human beings I ever met. Their beauty radiates from the inside and the outside.Yes, I am a proud mama! New York City Council Member David Weprin speaks to my students about the importance of laws in a society. We enjoy creating mock trials during the year. These lessons develop our critical thinking skills. This pic was taken in my SEM law class. We called ourselves The Legal Eagles. Check out the work of Joe Renzulli to learn about the School Enrichment Model. One of the great things about being in New York is the ability to see some of the greatest talent in the world. I enjoyed an evening of the blues performed by the one and only Jimmie Vaughan at BB Kings. My students had a great time ballroom dancing. Here is a picture of the second graders dancing during a Holliswood School talent show. A special thank you to ballroom dancing instructor Michael Pagan for his expertise, patience, and generous spirit. A special thank you goes out to The Holliswood School PTA for their support and encouragement. Ballroom dancer Michael Pagan and his partner entertaining our school community with their fancy footwork. Michael donated many hours of his time working with my Kids for Coltrane Club. Starbucks highlights some of the greatest music of our time…I was thrilled to see Coltrane’s music available while buying my mocha frappaccino grande in New York City. I think it is terrific that Starbuck is promoting the music that is the soundtrack of our lives. Listening to the incredible and elegant pianist McCoy Tyner in Huntington Long Island was a privilege. This is a pic of Yasuhiro Fujioka when I was chatting with him at Jazz at Lincoln Center on the evening of the 5oth Anniversary of Kind of Blue. Fuji is a Coltrane historian, dedicated to his work and a kind gentleman. I had the opportunity to meet him a number of times, including being in the same classes on Coltrane led by Phil Schaap. On this evening it felt nice introducing my son Anthony and daughter Victoria to his son Hiroki…all beautiful people. Pic of the children in the classroom studying the work of Pablo Picasso. They created individual stories using the painting The Three Musicians as a springboard for their imaginations. In addition, the students were inspired to create artwork in the style of Picasso which is on the bulletin board. Throughout the year the children examined the paintings of the masters, colored them in their own way, and then proceeded to think through the pictures. They wrote wonderful, creative, and unique fictional stories. Some of the artists we worked with were Norman Rockwell, Georgia O’Keeffe, Mary Cassatt, Claude Monet, Vincent van Gogh, Paul Gauguin, Paul Klee, Salvador Dali, Andy Warhol, Rembrandt, Michelangelo, Picasso and many more. The children focusing on the life and art of Georgia O’Keeffe during Women’s History month. My students William and Jade ballroom dancing during a special Holliswood School Pinwheels for Peace assembly. The school children collected cans of food and donated them to people in need. I want to thank my colleague Marisa Guglietta for organizing this peace event. It was wonderful to discover that my student Esther was a talented pianist. When I made the discovery, I asked her to perform at The Holliswood School special Pinwheels for Peace celebration…she beamed as she performed classical music and brought joy to all the students, parents, and educators in the audience. During the year the children work on many writing projects. We use the Writer’s Workshop model. Here I am with Stav showing a flower we created for our procedural writing project. The students wrote out all the steps to teach others how to do or make something. After the class created beautiful tissue flowers and wrote out the steps, we packed them up in a box. The children then wrote a letter to the blues singer Etta James. They had been listening to some of her songs, including At Last. Etta was coming into New York City, so I decided to take in one of her amazing shows and hand delivered the flowers to her. She stopped the show to acknowledge the teacher who brought in the flowers from the students. Wow…was that a great feeling! Congratulations to my students and to Etta for appreciating each other. The students focusing on a game of Chess during Choice Time. Children can choose centers to work in during this time of the school day. They love working in these learning groups. 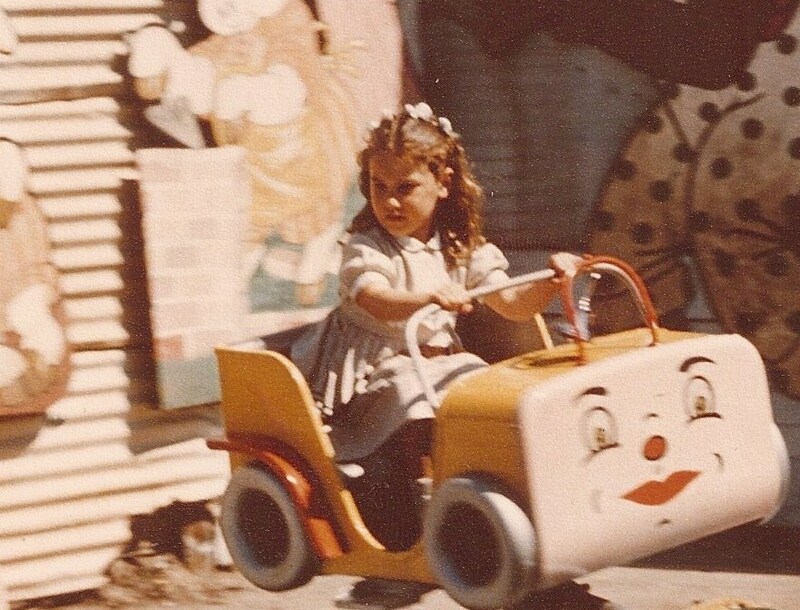 My first car…enjoying our local amusement park while growing up in Brooklyn, New York. Truly one of the kindest human beings I ever met…my cousin Frankie. 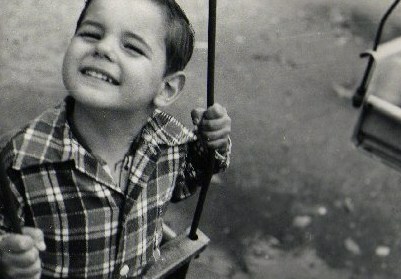 He was the inspiration for my children’s story “Little Christine and Frankie” and my essay in the This I Believe series. My angelic cousin was like a brother to me, and when I was fourteen years old one of the darkest moments of my life occurred…Frankie at age eighteen died from the effects of heroin. I did not and still don’t understand his decision to go in that direction. I will say firmly to all the young people who read this website…do not turn to drugs…it is never the answer. This is my junior high school picture. I was in ninth grade…and I must say a very serious student. I was a member of the Arista and Archon honor societies and valued my education. Can you find me? I went to Marine Park Junior High School in Brooklyn. I am proud to say many talented and creative people came out of Brooklyn and went to MPJHS. Did you find me yet? Okay, I can help with that…I am in the third row from the bottom moving up, and then count the fourth person from the left…that’s me. 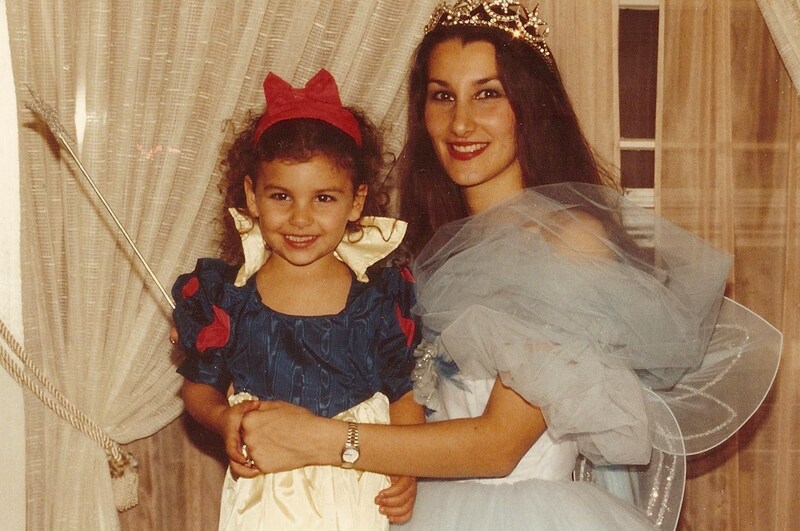 This pic is after a Halloween party at school in the beginning of my teaching career. My daughter enjoyed visiting me and on this day she had a great time sharing in our school celebration. My precious young students studying a Stuart Davis mural at The Metropolitan Museum of Art. Here they are with museum educator Sassy Moral. To learn more about Artful Thinking go to Harvard’s Project Zero link on this site. My students researched the lives of characters they chose from history. After weeks of study they “became” their characters and shared the lessons learned with their classmates. They all did terrific work and displayed the depth of their understanding. For more on Teaching for Understanding see the work coming out of Harvard’s Project Zero. What a treat it was to read my children’s stories for our PTA Fundraisers at Barnes and Nobles. I love writing and truly enjoyed sharing my books. 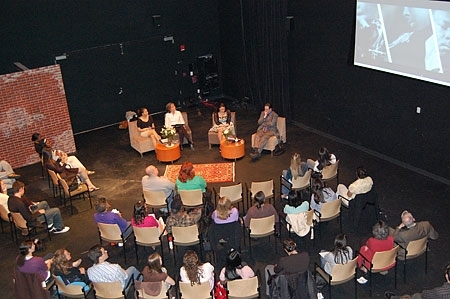 Adelphi University interviewed me for their Inside the Teacher’s Classroom event. The host was the elegant and intelligent Professor Diana Feige. What an incredible day for me! Here I am at the Waldorf Astoria attending the NOIAW luncheon honoring Geraldine Ferraro. She has been a woman I looked up to all of my life. ( See pic with Gerry on my Home page.) I had the pleasure of speaking with Attorney General Andrew Cuomo and Governor Mario Cuomo. Here I am with Andrew Cuomo. I happen to drive by the original Cuomo home every day on my way to work in Queens, New York. The famous Blue Spruce tree is still alive and vibrant. It inspires me each day to never give up on my dreams. A great children’s book to read is The Blue Spruce by Governor Mario Cuomo. One of my favorites!!!! Mario tells a warm and loving tale of the time he and his father saved a magnificent tree against the odds. That moment and his father’s belief to never give up on his dreams guided Mario throughout his life, and it is also a source of inspiration for me. New York City offers some of the most exhilarating experiences. After dining with my daughter at PJ Clarkes, and seeing the Mary Lou Williams Tribute at Jazz at Lincoln Center, we walked around Lincoln Center and took in the sights and sounds of this most magnificent city. Erica von Kleist is an outstanding member of the Jazz at Lincoln Center Orchestra. She is an extremely talented musician. During the performance honoring Mary Lou Williams she did an amazing job representing women in jazz as the only female performer in the orchestra that day. Erica is a gifted saxophone player. This was the second time I had the pleasure of meeting her. Last year my students were invited to a private performance with Erica and her quartet. The children had such a memorable day and it was a learning experience that will be added to the tapestry of their lives. Meeting Gayle King at the Jazz at Lincoln Center Fall Gala 2009 was very uplifting. Gayle is the Editor at Large of O, The Oprah Magazine and host of the Gayle King Show on Sirius/XM. What a spectacular evening this was!!! My daughter Victoria and I enjoyed an evening listening to the Jazz at Lincoln Center Orchestra as they paid tribute to the music of Francis Albert Sinatra. Special guests that evening were Michael Feinstein and Diahann Carroll who sung beautifully. Mr. Feinstein will be joining JALC as director of its new popular music series. The orchestra was in full form and the room was swinging. Proceeds from the Gala benefit the thousands of performance education and broadcast events the organization produces each year. I had an opportunity to tell Ms. King about the Kids for Coltrane project in education, and our desire to help raise the profile of jazz in American schools… I am still smiling from an evening of music that filled my heart with song. Autumn in New York, November 2009…and what a great way to celebrate this vibrant season listening to Jazz Royalty…Ravi Coltrane played the saxophone beautifully….playing music from his heart and soul…playing his truth…Ravi is the son of two jazz greats, John and Alice Coltrane…he has their gift of music, deep warm spirit and thoughtful intellect…joining Ravi at the Iridium in NYC was the Geri Allen Trio…such a joy to hear Geri’s brilliance on the piano as well. Check out Ravi’s new CD Blending Times…~Ravi the Kids for Coltrane can’t wait to meet you and sing their version of Equinox for you…we call it Hamlet’s Child…until then keep following your bliss. The Coltrane Home on Long Island… I had the honor of being invited into the Home during the Fall of 2009. It is a historic home. It is not open to the public yet. My students and I raised funds to help the non profit Friends of the Coltrane with their efforts to transform John Coltrane’s home into a place of learning. Their president Steve Fulgoni informed me that the funds the children raised went toward the beautiful white wrought iron fence and the surrounding garden….congratulations to the Holliswood school community for their support and generosity. 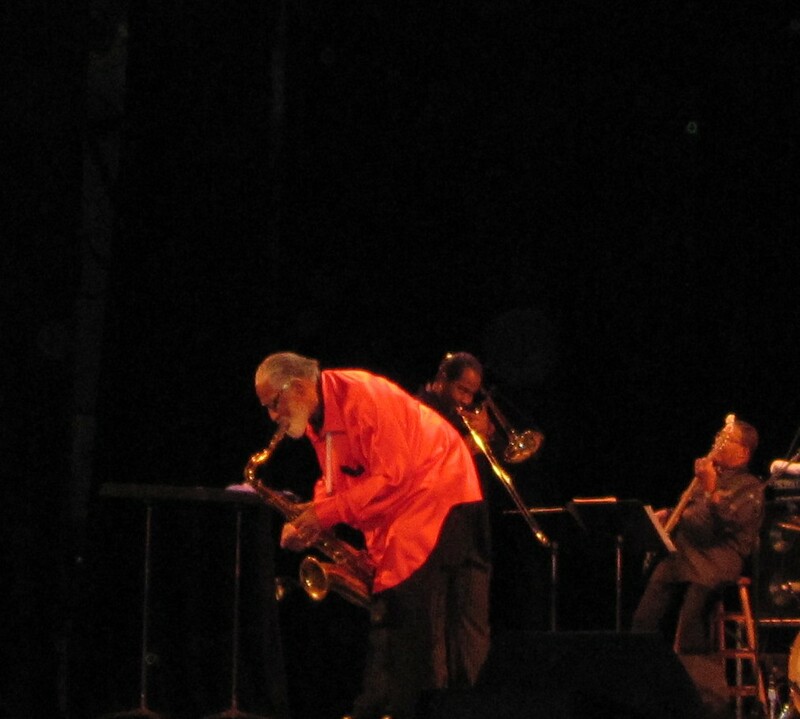 December 2009…What an extraordinary experience it was to see and hear Sonny Rollins perform in concert for Pete Seegers Clearwater project in Tarrytown, New York. Sonny is a national treasure…his talent appears to be super human…I will never forget this magnificent afternoon which unfolded majestically in Tarrytown’s Music Hall!! 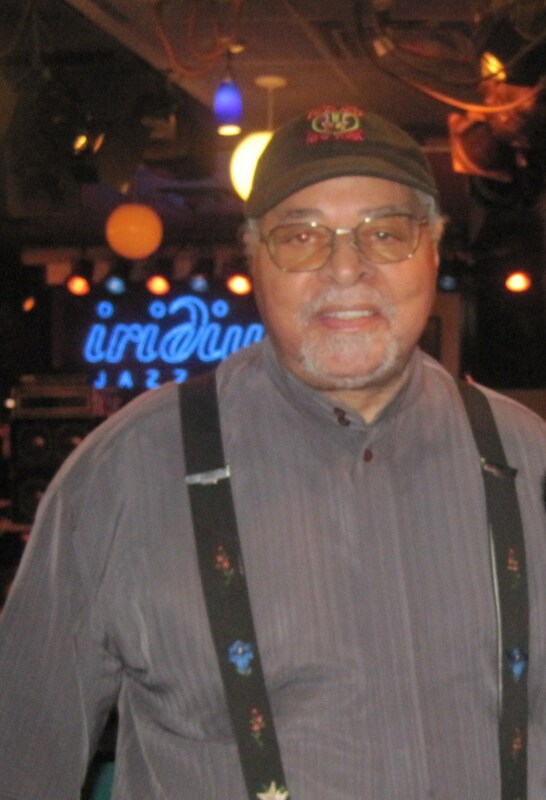 What a way to celebrate the ending of 2009…hearing legendary drummer Jimmy Cobb at the Iridium in New York City!! Jimmy performed masterfully with Four Generations of Miles which included Sonny Fortune, Buster Williams, and Mike Stern. I had the opportunity to chat with Jimmy’s daughter Jamie who was certainly proud of her most magnificent father. It was a pleasure telling Jimmy and Mike about The Kids for Coltrane Project in Education. I must say I was filled with joy when they started to soulfully play My Funny Valentine which has special meaning to me. 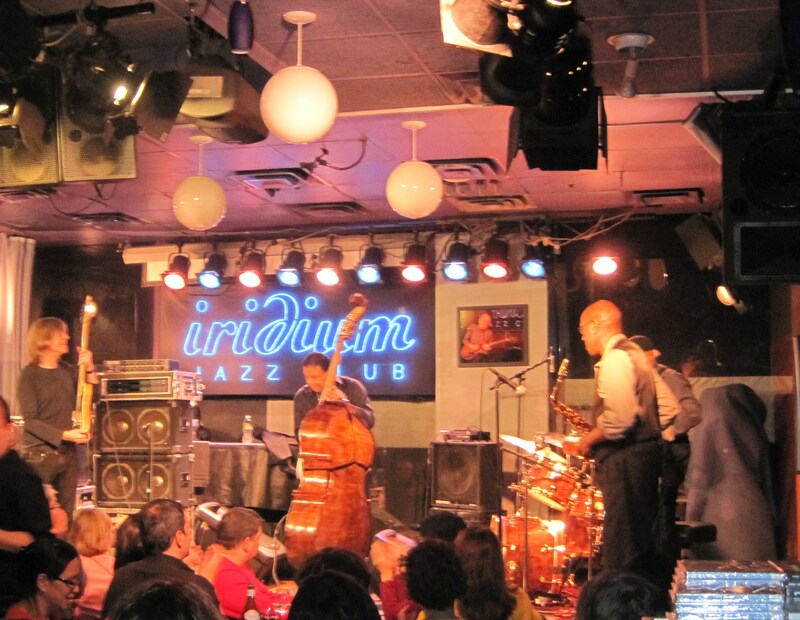 Parents please be aware that the Iridium does admit children too, so if you are thinking of an enriching experience why not take your child to a real jazz event at this very cool NYC venue. It was truly a wonderful experience hearing Mike Stern play his guitar brilliantly. He joined Jimmy Cobb, Buster Williams and Sonny Fortune at the Iridium on December 27, 2009. Mike is a premier jazz guitarist and composer. In 2007 he was awarded The Miles Davis Award. 4 Generations of Miles highlighting the best of the music of Miles Davis at the Iridium in New York City. The Kids for Coltrane students celebrating after our Gift of Song Concert in June 2010. 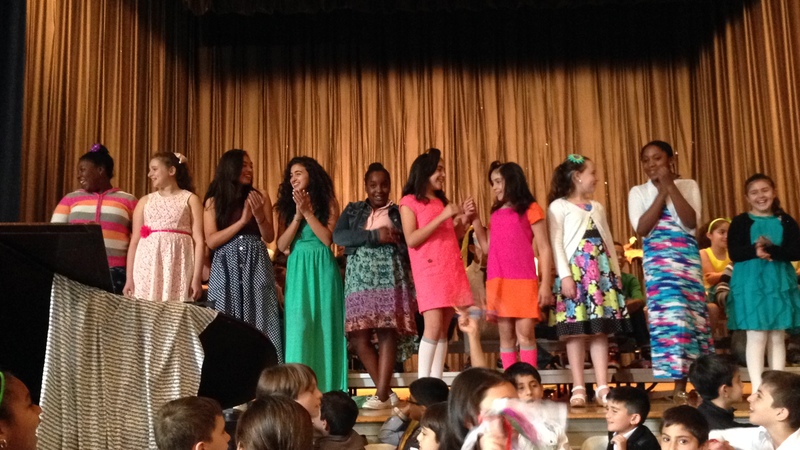 This group of lovely girls became known as “The Girls from the Flower Shop” after their incredible performance doing the West Coast Swing to the blues song “The Girl from the Flower Shop”… Always remembering children are as precious as flowers in springtime! Second grade student Maya presenting her Land of Sweets Project. 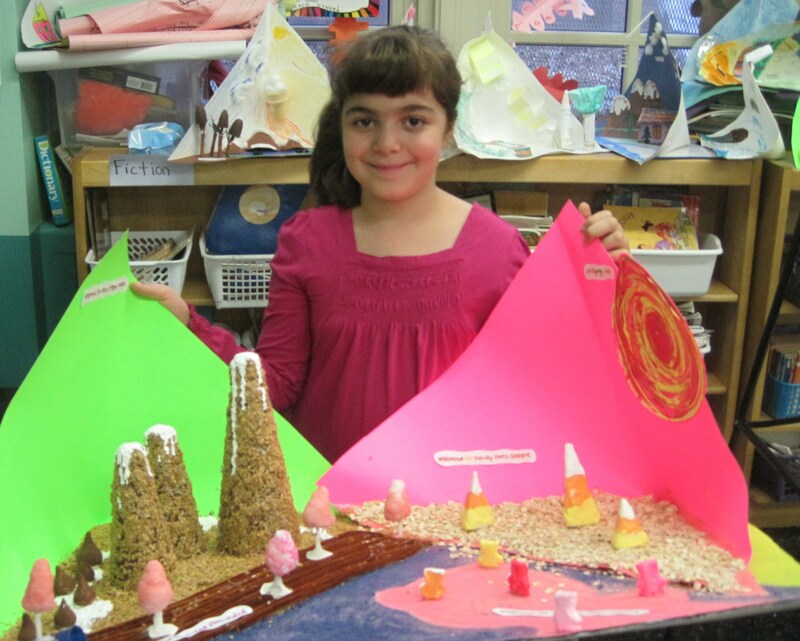 She used her knowledge of landforms to create this project. During this presentation she taught her classmates all that she had learned about geography. Great job Maya! This was a culminating activity which also helped assess the children’s knowledge of this unit. 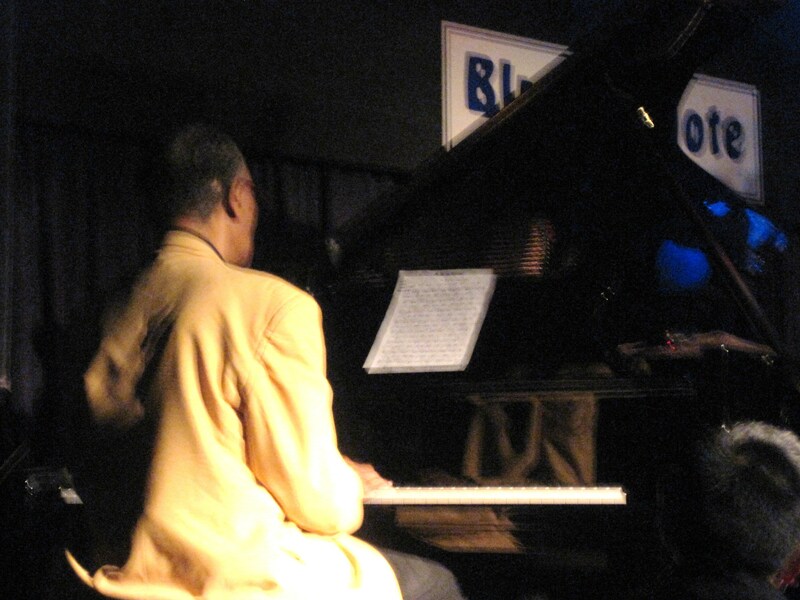 I had the wonderful opportunity to hear pianist McCoy Tyner perform live in New York City. 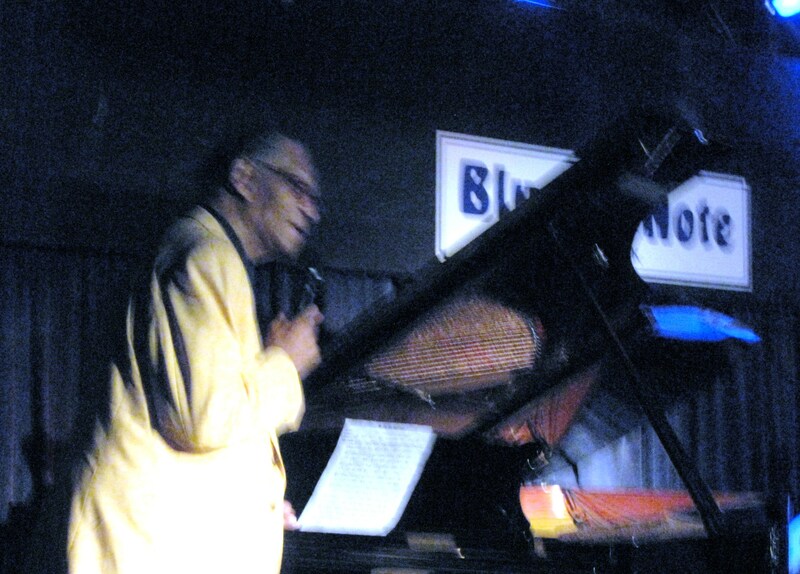 It was Valentine’s Week 2011 and Mr. Tyner focused on some of the ballads that are now classics from the John Coltrane and Johnny Hartman collaboration…and of course McCoy was on piano then too. I must also mention that hearing him play his own Fly with the Wind was a real treat for me. When I went back to class the next day, I shared my experience with my students and also had them listen to McCoy’s CD entitled Guitars during our Jazz Breakfast Cafe. Every morning my students start the day with breakfast in the classroom while listening to uplifting jazz music…such a nourishing way to begin the day! Pic of me smiling …always remembering to live with music in my heart and to continue to follow my bliss. 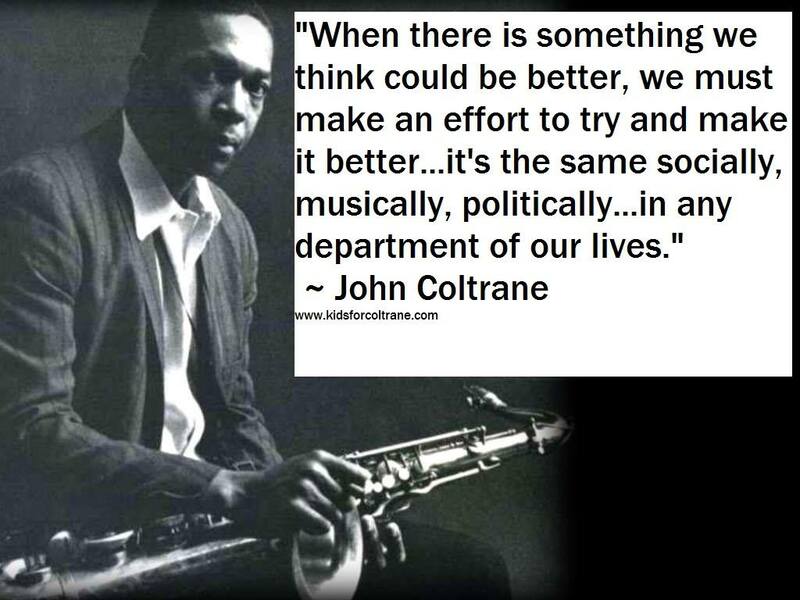 I am moved by this quote from Coltrane. John wanted to help humanity through his music…my desire is to make a contribution through my teaching. 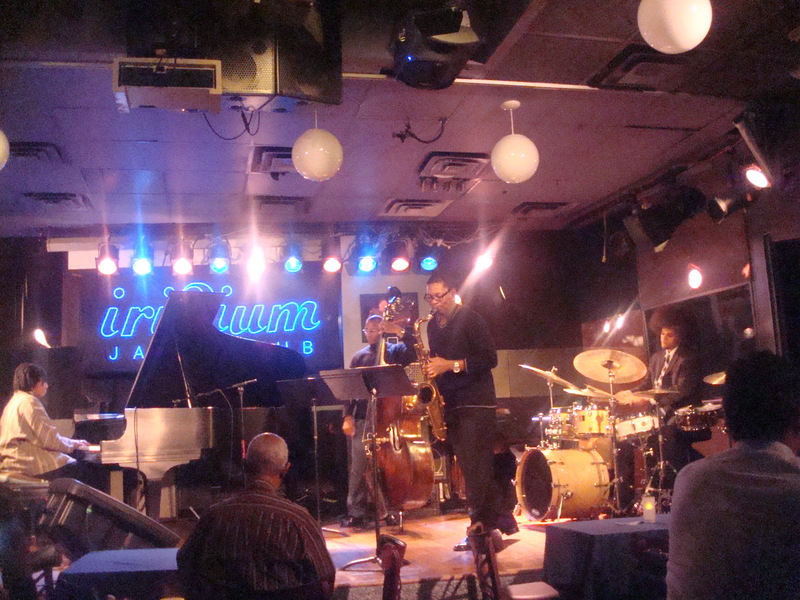 This picture was taken the evening I first met Ravi Coltrane at Birdland in New York City, June 2008. I was filled with pride because I was off to tell him about The Kids for Coltrane. One of the things the children engage in is philanthropy. 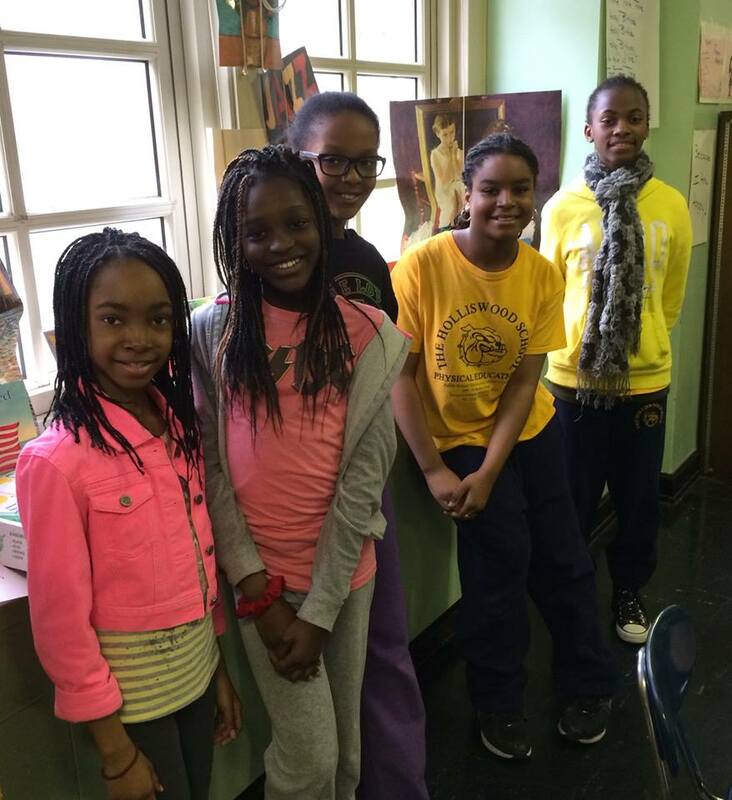 The students raised money to help Friends of the Coltrane Home, a non profit organization. To see details on our philanthropic effort see their link Friends of the Coltrane Home. You can also go to my Home page on this site… click on older entries at the bottom of the page to see more on this effort. Our hope is to one day see John’s Long Island home turned into a learning museum. 4 Responses to "♥Follow Your Bliss (Photos)"
MS.Passarella are you ok because of the tornado? Hi Seth, yes I am fine! The weather conditions didn’t affect me. All is well on the ocean where I live. Thank you so much for thinking of me. Hope you and your family are having a great summer. btw I have seen beautiful boats and ships recently. I know you want to grow up to be a ship builder…maybe one day your designs will sail the ocean blue. Hold on to your dreams!